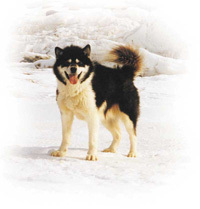 Nunavut has selected the Canadian Inuit Dog (Canis familiaris borealis) to be the official animal of the new territory. Called Qimmiq in Inuktitut, this dog is one of the world's oldest pure breeds and, from archaeological evidence, is known to have been resident in the Arctic for at least 4000 years. This dog has been essential to the survival of the Inuit for generation, being the only draft animal for long-range travel and a willing and capable hunting companion. The Canadian Inuit Dog is perfectly suited, through long adaptation, to survive in the hostile Arctic environment. They are thick-coated, robust animals of medium size (30-38kg. ), with curly tails, upright ears and an overall appearance of strength and stamina. The breed is non-colour specific with all known dog colours and shades being possible. The breed is free of genetic defects, thrives on a diet of protein and fat and is first and foremost a superb working animal.